Our Products >> .50-110 Winchester, New 450 gr. Lead, One Cartridge, not a Box! One Cartridge not a box, unless you by 20 cartridges which will be in the box. 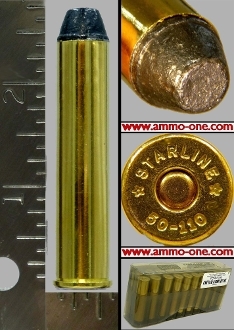 One Cartridge not a box: .50-110 Winchester, new production by PCI using new Starline Brass with “STARLINE * 50-110 *” Head-Stamp and loaded with a 450 grain Lead projectile. Loaded with Smokeless powder to original Black Powder Pressures. Use only in firearms in excellent condition! This cartridge was first design around 1887 as the 50 /100/ 450 Black Powder. were just different Head Stamps and loadings in the same cartridge case. older black powder pressures for older firearms. .50-110 Winchester, New 450 gr. Lead, One Cartridge, not a Box!